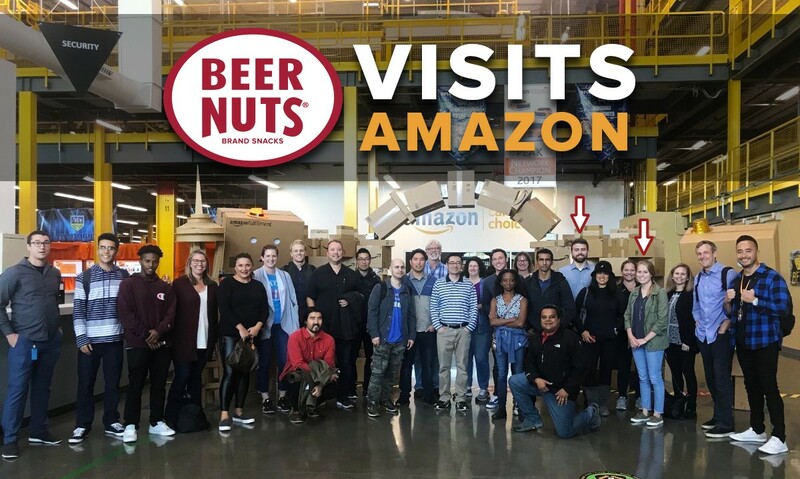 You can find BEER NUTS® Brand Snacks all over the US: stacked high on store shelves, across the counter of your favorite bar…even on towers of shelving operated by a fleet of bright orange robots in Amazon Fulfillment Centers. We want to create positive experiences for you, so two members of our Direct Sales & Marketing team took a trip to Seattle to find out more about these robots and their impact delivering your favorite nuts. Venturing through the impressive 800,000-square-foot facility in Kent, Washington, we learned how our product moves over 18 miles of conveyer belts and into your snack-craving hands. Inside the facility, humans and robots work together with mass-scale efficiency to deliver everything from our Original Peanuts keg for your next bash to a re-sealable bag of our mixes to restock your pantry—all within Amazon Prime’s ‘two-day shipping’ promise. We learned how to keep our product fresher for orders, showcase our product for more in-depth shopping experiences and communicate with you throughout the shipping process. That way, you keep an eye on your order through its journey to your doorstep. From our storefront shops to our online marketplaces, BEER NUTS® Brand Snacks continues to develop and improve ways we can deliver your favorite sweet & salty snacks! Stock up by visiting our Amazon Store.